Hotel Formule1 Paris Porte de Mountmartre offers you a room for travelers around the globe. Located in the city centre, this hotel has easy access to many of Paris' sightseeing, shopping, and entertainment options. Amenities and facilities in each of room included: double size bed with extra bed on the 2nd level, hanger, corner table, tv with italian tv cable stations, washtaffel, and heating/air conditioned room (not working). Bathroom (shared) : shower cab (hot and warm water), soap included. consider this is a budget / low cost hotel, which just (luckily) located in Paris city center. It's cheap because of the shared bathrooms and toilets. They should provide more cleaning staffs. There are four out of five available toilets in one row, and the broken toilet smells very bad. Oh yes, they also have microwave (shared) in the lobby nearby the dining room, but we just found out that they never clean it. 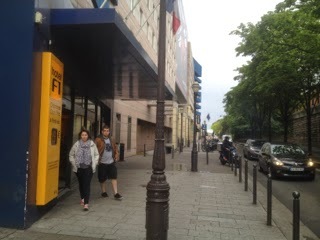 You can park your car for 20euro per day (2 euro per hour) on the basement level of this building. 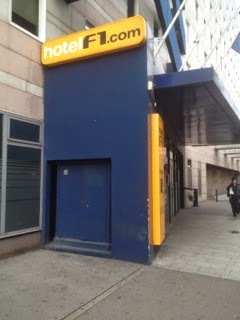 It's an old basement shared with IBIS Hotel (they are on the same group), but the basement smells very bad. Room / Interior / Decoration : 2 out of 5. Pale white combined with blue strip color, painted at old cement finished bricks. The laminate floor looks cheap and ugly, made from vinyl. In combination with the price (It is hard to find a nice room with price below 100 Euro in Paris for a night stay), the room itself was in so so condition. We book Hotel Formule1 Paris Porte de Mountmartre online from website, the room is look the same with the promotion picture. The wifi is working but you will have to re-connect it once you log off your device, or in standby mode. It's consider very "budget" room. Exterior : 2 out of 5. We just don't like the hallway. It just too crowded with a lot of doors, and creepy in the evening! Friendly and helped staffs: 3 out of 5. Ready to Paris? I don't recommend you to stay here, there are 4.000 other hotels you can find online. Consider another cleaner and nicer one. Book another hotels in Paris here!